Everyone has been flipping out about the McRib being back for a limited time...blah blah blah. There is something creepy about pork being squished into a rib patty shape and marketed on a bun. Too weird for me, plus I don't remember being all that fond of them in high school. Don't fret though I recruited a reader to review it! I have been doing really well lately about not eating fast food, but I couldn't resist going to Mcdonald's. 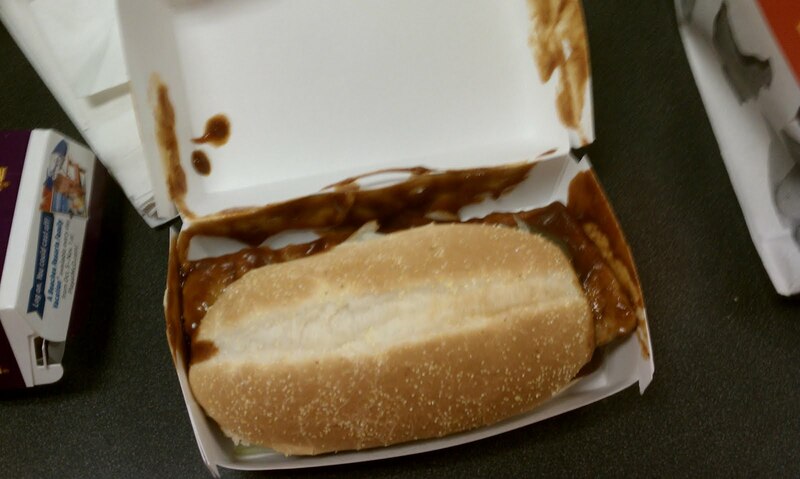 I mean I had to try the Mcrib, IT'S BACK. Well its bit the same shape as it used to be. They used to look like a rack of baby back ribs. Now its just a slab of "meat" pressed into a rectangle. My first bite brought back some good memories. It was absolutely delicious. I highly recommend anyone getting a few since its only back for a limited time. There is a reason the public demands this bbq sammy to come back years after it was first introduced. I have heard stories about people traveling several hundred miles just to get one. Thats a little extreme for me, but to each there own. I don't see why Mcdonalds doesn't just make it a regular every day item?? Maybe that's half the appeal, is that you can't get them all the time. Enjoy, I know I will be back for at least one more.